One of the things I’m enjoying about living in North America, and I’m speaking from a culinary perspective here, is the availability of Mexican and Tex-Mex style food. There isn’t exactly a huge following of this cuisine back home, unless you can spell Old Elpaso. I love how easy the food seems, how fresh and how there seems to be a real culture of love for the making of the food. If you need a little inspiration, just follow, for a few moments, in the Homesick Texan’s footsteps and be motivated. Nowadays we often have a fabulous, if somewhat messy, dinner of Taco’s or Tortilla’s and it’s such simple, fun food that you can’t help but enjoy it in a child-like, lick the fingers kind of way. I always seem to end up with such an overstuffed Taco that as I take my first bite the whole thing invariably comes apart in my hands in a sticky mass of chicken and salsa and guacamole. I usually giggle the whole way through. Anyway, as one of our favourite restaurants here in TO, a Latin Fusion place, if you will, they serve a dish hysterically named “Pork and Roll” (which always makes me think of those Elvis Presley wall clocks with the swinging legs counting the seconds down) combining a spicy, hot hot mix of pork and pineapple on flour tortilla’s. Super yum, even though I’m not usually a fan of fruit on my meat. I figured a mango could taste just as good and Voila! – mix the cumin, coriander, cinnamon, thyme, salt and pepper in a bowl. Add pork, coating well with spices, and let stand for 10 mins or so. – heat the oil in a large skillet, add meat and brown. 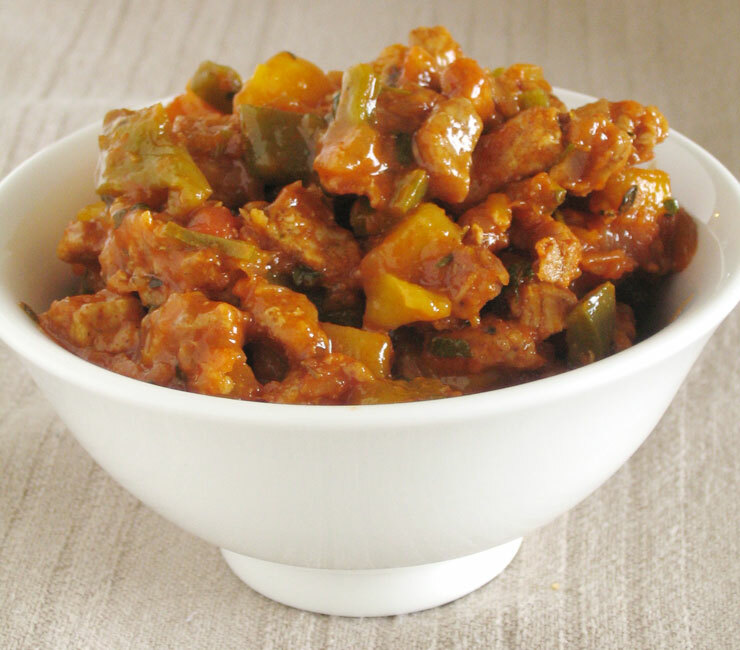 – Remove meat from skillet, add garlic, onion and green pepper. Saute for 2 mins. Add tomato paste and tomatoes. – Add vinegar, sugar and lime juice and cook until tender, about 10 mins. Replace pork and simmer until pork is cooked through. 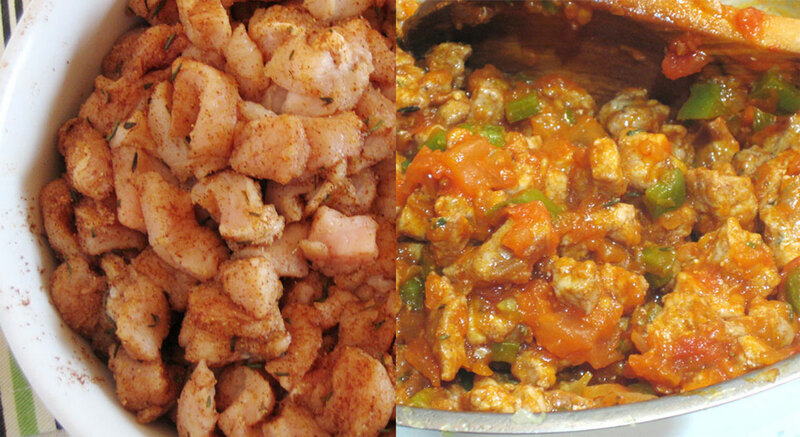 – Stir in mango and cilantro and remove from heat. 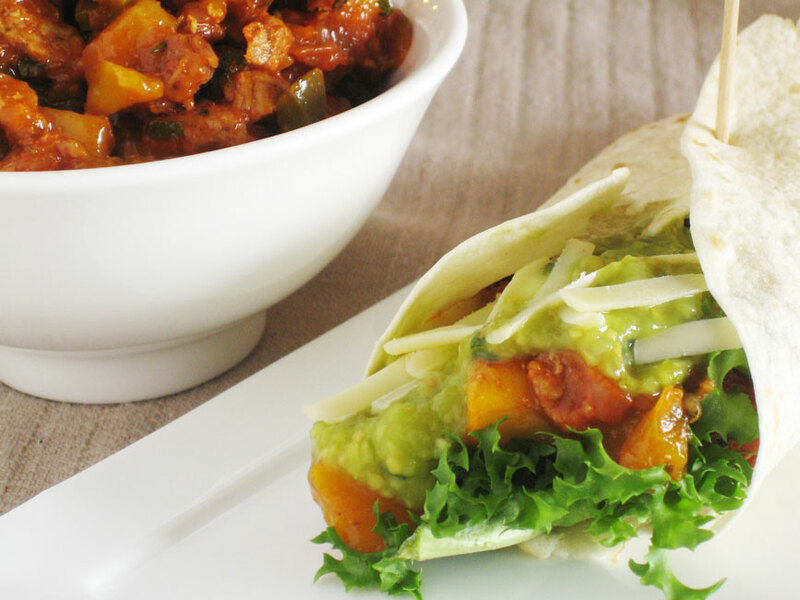 – serve in tortillas with lettuce, salsa and cheese. The reason I’ve been a bit slow in getting the next post up is because I hit a little boulder on my road to a good dessert this week. I had this idea in my head, and the more I thought about it the better it became. It all started when I started thinking about the four banana’s I had sitting on my Kitchen counter. In my world, a banana has a very short window of opportunity for eating. One day on the early side of the window and it’s green and chewy ; one day on the other side and it’s a powdery mush. These banana’s were a day or so on the downward slope of their life. Not an unusual circumstance, but the usual solution of banana bread or banana walnut muffins just didn’t appeal. What could I do with these yummies? So the idea of a compote came into being. With what? Hmm. A rice pudding perhaps? A tropical, Thai inspired rice pudding perhaps? What about a coconut and lemongrass rice pudding, with a banana and ginger compote and fresh mango? Sounds really good, really exotic, something a slender, tan woman in a fusia and turquoise sarong would serve to you in a coconut shell while sitting on a beach in Indonesia. Mmmm. So I diligently set about concocting a dessert which was to become possibly the worst dessert ever made in the history of man, ever. Well, I exaggerate. But the ever wonderful Mr. P stopped smiling rather abruptly after the first spoonful. And after my own first taste I realised that he hadn’t just swallowed a fly. Was it the over exuberant amount of fresh ginger I had used in the banana compote? Was the rice too sickly sweet? Too dry? 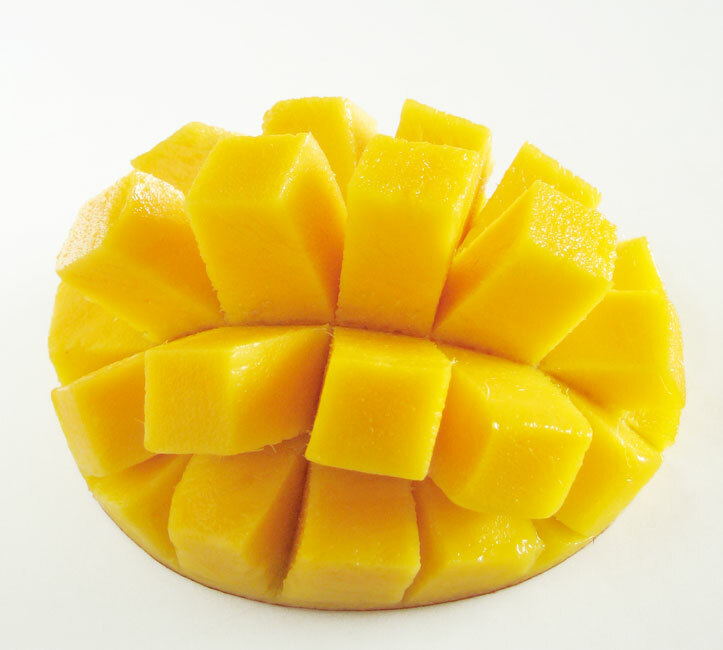 Was the mango cut into too large chunks, making it difficult to eat with the rice pudding? normal eating rice. How could I not know that? so many conflicting flavours to concentrate on. Simpler is better after all! -bring the milks, coconut and lemongrass to almost a boil in a heavy based saucepan. Add rice, bring to boil and lower heat to a simmer. Simmer, covered, 45 – 60 mins until thick and creamy. Leave to cool. – put water and sugar in a small saucepan, heat gently to melt sugar. 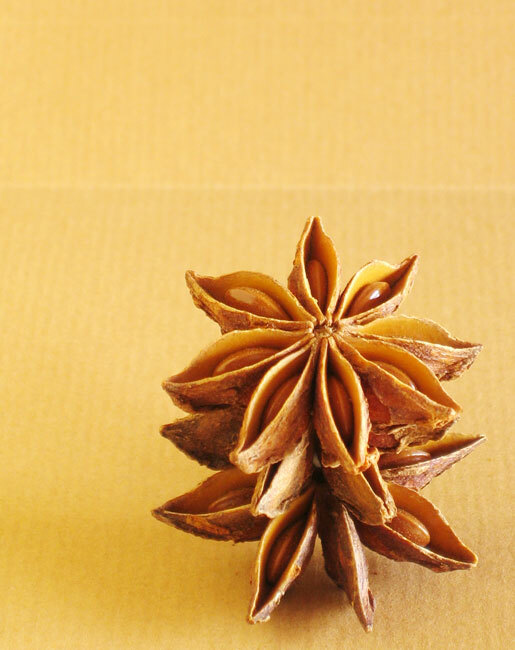 Add star anise and bring to a small simmer on a low heat. Simmer about 10 mins until syrup starts to thicken slightly. Do not caramelize. – Allow syrup to cool slightly before adding lime juice and half the zest. 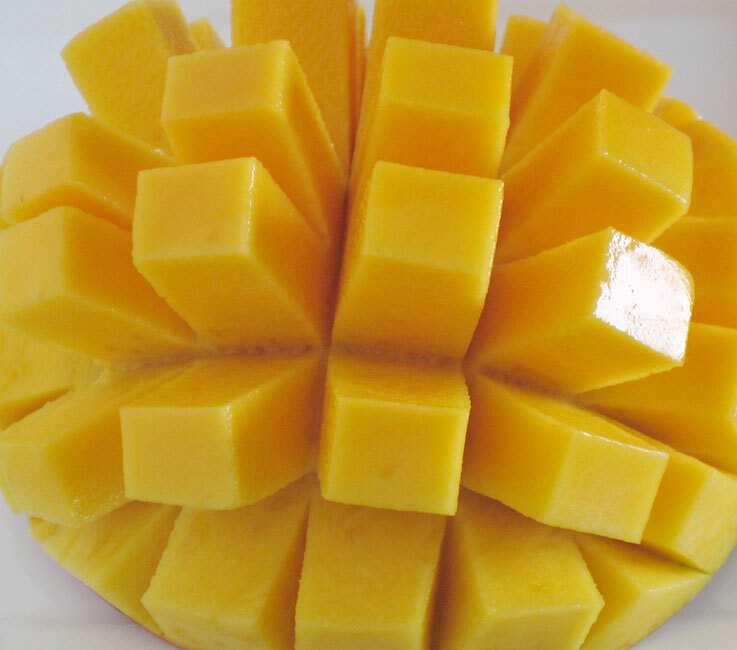 – When rice pudding is cooked and cooled, add lime syrup to mango. 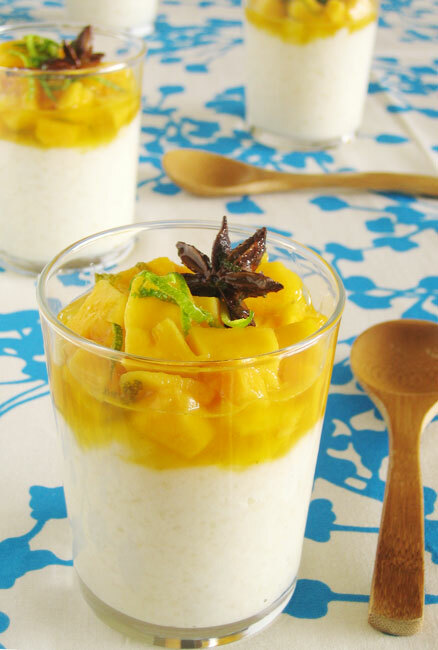 Remove lemongrass from rice, divide pudding between four bowls and top with mango. Garnish with remaining zest.